How I hickory smoked downtown Lawrence. 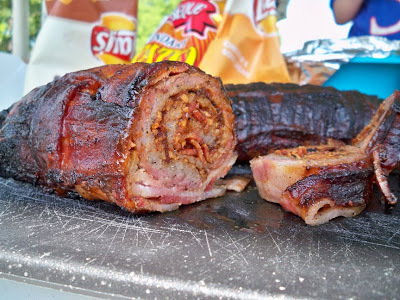 By now I’m sure you’ve heard of the Bacon Explosion, created right here in Kansas City by BBQ Addicts. 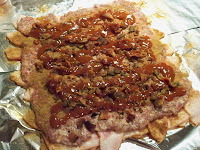 It’s a bacon tapestry layered with sausage, more bacon, barbecue sauce and rub, that’s then rolled up and hickory smoked before being finished off with a barbecue sauce glaze. 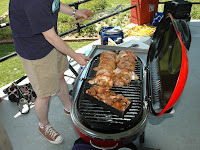 Nick and I had been talking about making it for a while, so we seized the opportunity at last week’s company picnic at South Park, down the street from our agency. 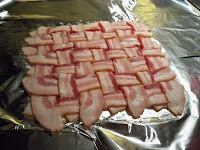 We actually made two Bacon Explosions, cooking the bacon for the interior and performing the assembly in our lunchroom, which does still and may forever reek of bacon. 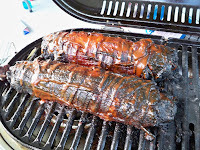 Rather than drag a smoker down to the park, we used a gas grill, setting a smoker box of hickory chips on the grate and indirectly cooking the Bacon Explosion. Admittedly not ideal conditions, but we made it work. You could smell the hickory smoke a good 50 feet away. So the ends got a little bit charred, and by charred I mean crazy burnt. 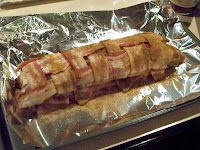 But the Bacon Explosion was still delicious, if on the salty side -- we followed the measurements for everything in the recipe pretty close, and three tablespoons of rub is probably a bit too much. As with all recipes, I figure the first time is practice. The next time will be perfection. The Monday night special at Callahan’s is a half-pound burger and fries for $5. That’s a pretty good deal, so we decided to head that way for Guys’ Night this month. 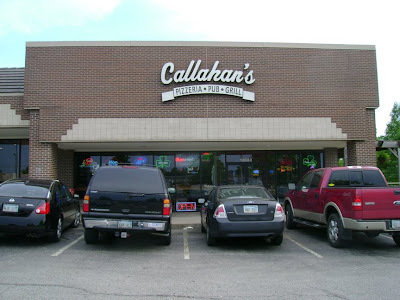 I’ve always liked Callahan’s. It’s got a nice, low-key neighborhood vibe, and while it doesn’t seem like it’s ever crazy busy, it’s never totally dead either. There’s a lot of CCOTW (Crazy Crap on the Walls), and on this visit, two pieces really stuck out to me -- a skeleton that’s Dr. Strangelove-style riding a bomb hanging from the ceiling, and a framed photo of Shirley Temple. Callahan’s is the true originator of CCOTW, and Applebee’s totally ripped off this place’s thing. Years ago this actually was an Applebee’s, but it closed and now after however long it takes, Callahan’s has earned legal squatter’s rights. All of the Guys’ Nighters got the burger special, and McHugh and I split some wings, too. 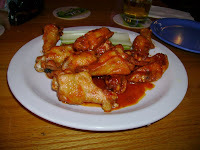 The wings were fine, kind of spicy but sweet. A dozen will run you $7.95, although on Sundays they’re only 25¢ a pop -- and at that price, I reckon they’d taste pretty fantastic. Makes me miss the truly cheap wing nights of college, when a quarter apiece was the norm, and some places would even go as low as a dime. While the burgers were certainly huge and tasty enough, they weren’t anything you can’t make in your own backyard, either. Cheese-wise, McHugh and Dorsett both got pepper jack, which was sliced big and thick. That may have been the way to go, because I don’t think my cheddar was much more than a wee bit grated on top that had melted into an inconsequentially thin layer. 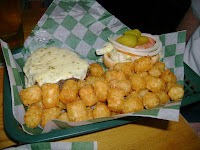 If you’re going to serve a half-pound burger, you’ve got to give it a proportionate amount of cheese. 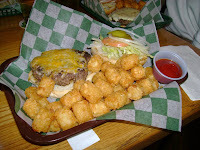 Along with your burger, you get your choice of fries or tots. No shocker, we all went tots. Like a mountain’s worth was piled into my basket -- I couldn’t even finish them. Other Callahan’s specials during the week include pizzas on Tuesdays and Saturdays, and on Wednesdays a slab of ribs for $13.95. I’ve got to say, while I haven’t had the ribs here, I have a hard time ordering smoked meats and other barbecue-related foods at places aren’t actual dedicated barbecue joints. I mean, this is Kansas City -- home of Arthur Bryant’s and Oklahoma Joe’s and a gazillion other barbecue restaurants. Maybe I’m missing out and the ribs at Callahan’s are fantastic. But I don’t know. Something about it doesn’t seem right. If it sounds like I’m bagging on Callahan’s, I’m absolutely not. I’ve had nothing but good times there. The food is solid, even if it’s not quite spectacular, and apparently you can get a pizza the size of an area rug, so that’s worth something. I think what it comes down to is that Callahan’s is a great place to simply go and have a relatively cheap beer, maybe meet up with some friends at the spur of the moment and chill -- and honestly, the world could use more bars like that.